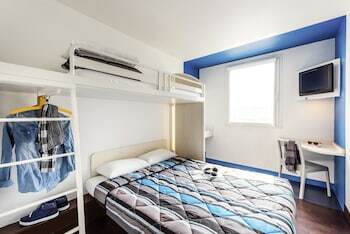 With a stay at hotelF1 Villepinte Parc des Expositions in Villepinte, you'll be a 3-minute drive from Paris Nord Villepinte Exhibition Centre and 8 minutes from Aeroville Shopping Center. This hotel is 9.1 mi (14.7 km) from Stade de France and 8.6 mi (13.8 km) from Saint Denis Basilica. Stay in one of 72 guestrooms featuring flat-screen televisions. Complimentary wireless Internet access keeps you connected, and digital programming is available for your entertainment. You'll be asked to pay the following charges at the property: A tax is imposed by the city: EUR 0.44 per person, per night We have included all charges provided to us by the property. However, charges can vary, for example, based on length of stay or the room you book. We understand that sometimes your travel plans change. We do not charge a change or cancel fee. However, this property (hotelF1 Villepinte Parc des Expositions) imposes the following penalty to its customers that we are required to pass on: Cancellations or changes made after 6:00 PM ((GMT+02:00)) on Apr 28, 2019 are subject to a 100% Cost of Stay penalty. If you fail to check-in for this reservation, or if you cancel or change this reservation after check-in, you may incur penalty charges at the discretion of the property of up to 100% of the booking value.